What does the future hold for Baltimore? What is our collective vision, and what do we need to do to get from where we are today, to the brighter future we all hope for? These are the things we think about every day in the Department of Planning. Planners want to make the world a better place, and the people of the Department of Planning have one central mission: to make Baltimore the most livable, dynamic, sustainable and attractive city it can be, now and in the future. To help the City of Baltimore achieve its full potential, the Department of Planning focuses on empowering communities, guiding development, promoting quality urban design, recognizing and adapting to change, preserving and promoting our historic heritage, all while seeking to make Baltimore greener, and more sustainable. To accomplish these goals, we work hand-in-hand with the Mayor, the City Council, our fellow City agencies, community organizations, the business community, foundations, state and federal partners, and the citizens of Baltimore themselves. This annual report features a range of activities and projects we worked on in 2011, some of which have continued into 2012. Progress is being made, despite our local and national economic struggles. I hope this report gives you some useful information about the direction we’re heading. I also hope it inspires you to get more involved in helping to make our collective vision a reality. In preparation for the National Bicentennial Celebration of the “The Star-Spangled Banner”, the Department of Planning and the Commission for Historical and Architectural Preservation CHAP Restored Baltimore’s Battle Monument. After almost 200 years of exposure to the elements, the “Lady Baltimore” sculpture on top of the monument is extremely fragile and must be relocated to a stable interior environment. The original “Lady Baltimore” will be moved to the Walters Art Museum and a reproduction will be installed, replacing the fragile original. The four “Griffon” sculptures will be reconstructed on site, so that the crucial missing features will be restored. On September 12 and 13, 1814, Baltimore achieved an incredible victory over the forces of the British. The Battle Monument, begun in September 12, 1815, and completed in 1825, is the first significant war memorial to be built in the United States. It commemorates the sacrifices of those who died in defending the city from the British attack in September of 1814, the same attack which was the occasion for the writing of the National Anthem. It is also the first monument in the United States to honor the common soldier. As the emblem of Baltimore City, the restored Battle Monument will be a source of civic pride during the National celebration! Read More about the Battle Monument. 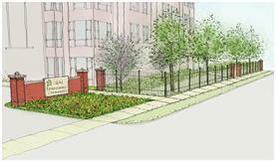 Several years ago the Planning Department worked with community stakeholders to develop the Park Heights Master Plan. The Master Plan has resulted in millions of dollars of investment by a wide range of partners. Recreation and Parks is putting the finishing touches on renovations of a multi-purpose field at Reisterstown Road and Woodland Avenue. As part of this project three buildings were demolished, including the infamous Night Owl Lounge. The practice field was renovated and re-graded for games, old play equipment was removed (new equipment was installed a few years ago across the street), new fitness equipment and game tables were installed, and the basketball court was converted to parking. Baltimore Housing is completing site assembly along the 4900 block of Denmore Avenue for the future development of a new 7-acre park. The Cal Ripken, Sr. Foundation has partnered with the Department of Recreation and Parks to develop the first phase of this park. The design process is still at the early stages; but so far the design includes a multi-purpose field (baseball/football), basketball court, playground, splash pad, walking path, and parking lot. 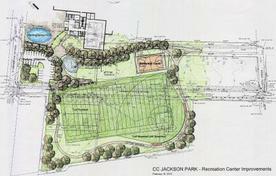 In addition, design is beginning for renovation and expansion of the adjacent CC Jackson Recreation Center. Park Heights Renaissance, Inc. (PHR) and Comprehensive Housing Assistance, Inc. (CHAI) have partnered to secure HUD 202 funding to build 60 units of senior housing at the former site of “The Ranch” at Pall Mall Road and Pimlico Road. Groundbreaking is expected by the end of the year. Photo Note: The image above is a perspective site drawing of the future Renaissance Gardens, a 60-unit senior living community being developed as a result of the Park Heights Master Plan. It also inspired the title of our annual report and appears in the header above. 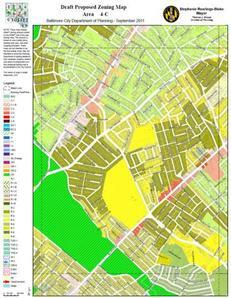 The Greater Rosemont and Coppin Heights Community (GRACE) Area Master Plan kicked off in 2011. Centered around the Coppin State University campus and a major portion of west Baltimore, the plan will focus on stabilizing residential areas, improving transportation and green spaces and creating connections between anchor institutions, like Coppin and Baltimore City Community College (BCCC), and with the surrounding communities. Planning for the historic Mount Vernon area is now underway. With a diverse range of residents including students, seniors, families and empty-nesters, Mount Vernon is a vibrant, centrally located mixed-use neighborhood, that also serves as a cultural hub for the city. This broad based community planning effort brings together residents, businesses and institutions to address long term goals and short term development issues. Transportation, parking and open space are key issues to be addressed. The Seton Hill Master Plan was completed in 2011, and recently adopted by the Planning Commission. The Seton Hill Master Plan makes recommendations for land use, zoning, open space and transportation in this small historic community, on the northwest corner of downtown. Priorities include open space improvements and programming, preservation of historic homes, and the clarification of traffic patterns within the neighborhood to support this residential neighborhood just north of Downtown’s Westside. The study of Belair Road began in 2007/2008 as a community driven effort between the City & County to develop a corridor study for revitalization. In spite of these efforts, the impetus behind the Belair Road TAP came when the Planning Department was awarded a 2010 EDA grant to complete a study with the help of an Urban Land Institute Technical Assistance Panel. The study consisted of a two-day workshop, input from expert panelists, and a final report completed in November. 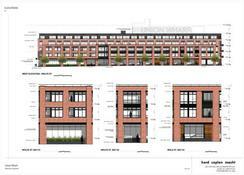 This report will serve as a catalyst to help bring new development opportunities to Belair Road. Based on the 2010 Census, downtown Baltimore‘s Census Tract 401 was the City’s fastest growing neighborhood, with a population increase of approximately 131%, mostly within the 18-34 age groups. 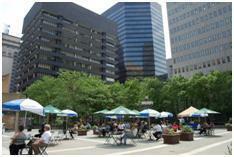 In 2011, the Department of Planning teamed up with the Downtown Partnership on the creation of a Downtown Open Space Plan and a Downtown Strategic Plan in an effort to keep this trend going. In fact, the Department received an award from the Downtown Partnership for its work in support of our thriving downtown. 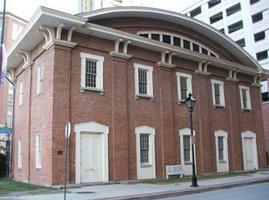 In 2011 the Mayor, in partnership with CHAP, the Baltimore National Heritage Area and the Friends of President Street Station, rededicated this significant national treasure. Timed to coincide with the 150th anniversary of the Civil War, the exhibits were updated and the structure was rehabilitated. In April of 2011, the Eastern National Bookstore opened a popular museum store in the museum. In addition, due to its deep history and links to Abraham Lincoln, Frederick Douglass, the Underground Railroad, and the first bloodshed of the Civil War, our U.S. Senators Barbara A. Mikulski and Ben Cardin (both D-MD) introduced legislation that authorizes the U.S. Department of Interior to evaluate the suitability and feasibility of establishing President Street Station as a unit of the National Park Service (NPS). Ashburton captures the essence of architectural styles and suburban house types of the 1920s. English Tudor, Colonial Revival, Italian Renaissance Revival, French Revival and other stylistic details decorate these houses. This well-cared for early 20th century suburban neighborhood has been the home of many prominent Baltimore African American leaders. Ashburton’s significant design and strong community association helped shape 20th century suburban development in Baltimore. As a designated local historic district, all future exterior improvements and new development will be reviewed by CHAP for compatibility with Ashburton’s historic character. 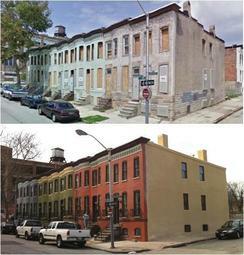 Qualified renovation projects will be eligible for Baltimore City Historic Tax Credits. The results of the U.S. Census are important to Baltimore because they are used to designate political boundaries, help understand community needs, and direct the allocation of state and federal funds. Many neighborhood organizations, foundations and universities analyze this data to help identify where and how to invest limited resources. To better understand the Census and its results, the Department of Planning is engaging in a thorough analysis of Census and other data sources to assess changes in Baltimore and its neighborhoods. These analyses will be disseminated to the general public through a series of policy briefs, called “Baltimore by the Numbers”. These reports can then be used by citizens, nonprofit organizations and civic leaders to inform and guide our efforts to make Baltimore a better, safer and stronger place to live and work. Upon completion of the Healthy Food Assessment in summer 2011, the BFPI (Baltimore Food Policy Initiative), housed within the Department of Planning, launched the Get Fresh Public Markets to improve the availability of healthy prepared foods in Baltimore City’s 6 public markets. As a result, BFPI developed 14 menus with healthy food labels, conducted 2 consumer focus groups, and surveyed 75 residents for a community food assessment as it relates to Lexington Market. In partnership with Johns Hopkins Center for a Livable Future (CLF), BFPI recently created a Baltimore City food desert map. In Baltimore City, 20% of the population lives in what is considered a “food desert,” and nearly 1 in 4 of Baltimore’s school aged children live in a food desert. BFPI is developing a citywide food desert retail strategy to support community-based partnerships to attract, retain, and enhance healthy food retail in Baltimore City. BFPI and Maryland Hunger Solutions collaborated to increase the number of Baltimore City farmers markets accepting SNAP (formerly known as food stamps) from 3 to 7 markets. The SNAP sales at Baltimore City farmers markets increased 45% from 2010 to 2011, with 4 additional farmers markets now accepting SNAP. In coordination with Baltimore Office of Promotion and the Arts, Baltimore City’s largest farmers market, the Baltimore Farmers’ Market & Bazaar, will begin accepting SNAP benefits in 2012. This fruit and vegetable campaign created by kids for kids included 2,000 elementary students creating 250 ads displayed in 16 interior bus panels, 10 metro station posters, 5 light rail station posters, and 7 Metro kiosks. The students’ ads are now a part of the citywide healthy eating campaign. In addition, the campaign developed 5 public service announcements. While the national and international media continue to cover the Poe House and its events, a consultant team was hired by the City to develop a business strategy to keep the Poe House open, without depending on annual City funding. The Edgar Allan Poe Birthday Celebration in January continues to be a success story, as are the fundraising events designed to raise funds for the Poe House, including: the Annual Cask of Amontillado Wine Tasting Event; Forevermore Gaia Print Sales; Pennies for Poe, sponsored by writer Rafael Alvarez; Poe Night at the University of Baltimore; the Lebanese Taverna Halloween Fundraiser; and the Bedlam Ensemble production of "The Delirium of Edgar Allan Poe" in New York City. In 2011, the Poe House was chosen to help promote the new John Cusack film "The Raven", through a Hollywood-style news conference at the Poe Grave, featuring the director and one of the stars of the film. As a result of this collaboration, the movie company sponsored a private Baltimore screening of the movie 2 days prior to the national release. The event was attended by 240 friends of the Poe House, at the Landmark Theater in Harbor East. Overall, it was a great year for the Poe House – as more and more people are visiting by walking from downtown destinations and using the Charm City Circulator. 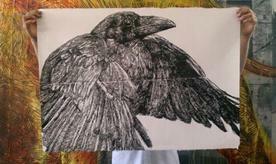 “Raven” print generously donated by the artist “Gaia” to sell for the benefit of the National Historic landmark Edgar Allan Poe House and Museum. To provide the highest level of service and leadership in urban and strategic planning, historical and architectural preservation, zoning, design, development, and capital budgeting, to promote the sustained economic, social, and community development of the City of Baltimore. As called for in the Comprehensive Master Plan, the City of Baltimore Department of Planning kicked off TransForm Baltimore: The Zoning Code Rewrite in 2008. The goal of this ambitious multi-year effort is to review, rewrite and replace the existing code (circa 1971) with modern tools that will support and guide City investment, enhance and protect neighborhood character, strengthen retail districts, and promote job growth. Throughout the entire process, TransForm Baltimore has involved an extensive community outreach campaign that has gathered input from citizens, businesses, the development community, professional organizations and others committed to the future of the City of Baltimore. Through the use of community forums, community planning, surveys, working committees and focus groups, the Department has gathered input from a wide array of interested stakeholders, and will continue to do so throughout 2012 as the new code is introduced, and ultimately adopted and implemented. We are planning to introduce City Council legislation during 2012, and that will mark the first step in the legislative, adoption and implementation phase of this important and long overdue initiative. For more information, please go to www.rewritebaltimore.org. Despite the current economic climate, 638 CHAP Notice to Proceed permits were issued in locally designated historic districts city-wide during 2011. This number is a strong indicator of the desirability of Baltimore’s local historic districts and continuing investment in historic properties, as well as dynamic and historically-compatible new construction projects. Since the program’s inception in 1996, the Historic Restorations and Rehabilitations Tax Credit program has generated over $500 million in investment in the City’s historic properties. A new and exciting trend over the past year has been the use of historic tax credits in rehabbing entire blocks or groupings of homes to stabilize neighborhoods in transition. Groups like Habitat for Humanity of the Chesapeake, Telesis Baltimore, The Reinvestment Fund (TRF), Druid Heights CDC, and Yankee Development, LLC, have been rehabbing groups of properties in historic districts including Patterson Park/Highlandtown, East Monument, Broadway East/South Clifton Park, Old East Baltimore, Old Goucher, Reservoir Hill, and North Central. Through their organizations’ unique approaches, they have worked to bring homeowners to formerly vacant blocks. Some have taken advantage of City programs like Vacants to Value, but all have followed CHAP guidelines and have qualified the properties for the historic tax credit. In 2011, CHAP approved over 70 tax credit applications from these groups and certified the completion of 36 of those projects. The Maryland Proton Treatment Center (MPTC), part of the University of Maryland BioPark Planned Unit Development (PUD) will provide cutting edge proton therapy for patients with cancerous tumors. MPTC will treat approximately 2,000 patients annually with the potential to improve medical outcomes, reduce side effects and promote the understanding of the use of advanced technologies in cancer therapy. The project totals approximately 108,500 square feet of space within this three story building. It has been carefully designed to meet its special healthcare needs while fitting in to the overall character of the BioPark. Located in Locust Point, a neighborhood rich in character and history, is the former Procter & Gamble soap factory, circa 1929. In 2009, this former industrial complex was transformed into the Tide Point Planned Unit Development (PUD), a 25-acre site with approval for over 549,590 square feet of office, retail and up to 140 dwelling units. Tide Point includes open space leading to and along the water, as part of Baltimore’s public promenade. Under Armour purchased the Tide Point Campus and by electing to remain on-site, created a revised master plan to meet the company’s projected space needs for the next ten years. There are currently 1,100 employees at Under Armour, and they are growing at a current rate of 300 additional employees per year. Under Armour will expand into the water side portion of the PUD, adding levels above the existing buildings as well as replacing the Tide building with a new, larger facility and parking garage. Under the revised PUD, the allowable retail square footage will increase from 25,500 to 50,000 sq ft, and the allowable office square footage will increase from 528,078 to 925,000 square feet. As a result, Under Armour can grow on-site, providing an important employment anchor for the City. The City faces many different natural hazards that impact our health and welfare. Flooding, heat waves, high winds, and snow have the most prominent impact on the City. In 2011, the Planning Department secured a grant to create a robust mitigation plan to lessen the impacts of natural disasters on life and property. This included the adoption of Digital Flood Insurance Rate Maps that identify areas that are vulnerable to flooding. The maps will assist the City to target mitigation measures that minimize damage, and allow for a quick recovery. The All-Hazard Mitigation Plan, the Climate Action Plan and the new Tidal Floodplain Maps, and their common elements (i.e. public outreach, identification of mitigation/adaptation measures) are being looked at together. This will allow the City to take a comprehensive approach in dealing with natural hazards, before they happen. By City Charter, the Planning Commission must submit a recommended six-year Capital Improvement Plan (CIP) to the Board of Estimates each year. In 2011, the Planning Commission recommended capital funding for 157 Projects with an estimated cost of $402,427,000. The Baltimore City Council is now considering the capital budget for FY 2013, which starts on July 1, 2012. Baltimore’s housing market typology was developed to assist the City in its efforts to strategically match available public resources to neighborhood housing market conditions. The typology is a critical tool for Baltimore Housing’s Vacants to Value program to address city-wide vacant housing challenges. In 2011, the Planning Department, with Housing, convened a work group to update the 2008 typology in collaboration with other city agencies and community stakeholders. The City has partnered with the Baltimore Metropolitan Council (BMC) as one of the recipients of the 2011 Sustainable Communities Grants, totaling $3.2 million. The Department of Planning, represented by Director Stosur, with staff from the Research and Strategic Planning Division, will participate in a Consortium that will develop and implement the Regional Plan for Sustainable Development (RPSD). The Baltimore Region’s planning effort will analyze trends in population, jobs, work force development, housing and transportation, and create a plan that enhances equity and opportunity for disadvantaged residents, while promoting long-term sustainability for all jurisdictions in the Baltimore Region. Planning will provide staff and technical support to help incorporate HUD’s livability principles into the framework of the plan. 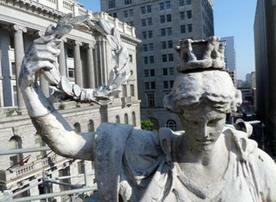 The push for the designation of more Baltimore City Landmarks continues in 2012. This year, CHAP is working with the Downtown Partnership of Baltimore, Inc. to designate landmarks from a list of over two dozen historically and architecturally significant buildings in downtown Baltimore. The Baltimore City Department of Planning’s Office of Sustainability with the Department of General Service’s Energy Office will be developing a Climate Action Plan (CAP) in 2012. The goal is for it to be adopted this coming November. Baltimore’s Climate Action Plan (CAP) will set short-term (2020), and long-term (2030) goals for reducing our green house gas emissions as well as responding to anticipated changes in our climate. The CAP will signify a huge step toward Baltimore’s Sustainability Plan goal of reducing green house gas emissions and addressing the physical impacts of climate change related to flooding and extreme heat events through adaptation, and we are excited that this process is underway. For more information on Baltimore’s climate action plan and related initiatives, click here. 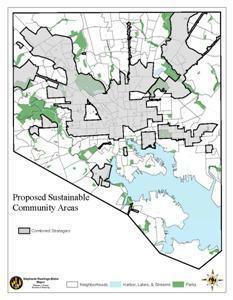 Planning is currently leading an interagency effort to identify areas for neighborhood revitalization and redevelopment, to be designated under Maryland’s Sustainable Communities program. By July 1, 2012, the city will submit an area-wide framework for sustainability and livability, through a collaborative, inter-agency effort. The Sustainable Communities program affords designated areas access to state funding and incentives, including Historic Tax Credits, Neighborhood Business Works, and enhanced Job Creation Tax Credits. This fall, Planning will join the Mayor’s Office of Employment Development (MOED) and BDC to update Baltimore’s Comprehensive Economic Development Strategy (CEDS). The CEDS document and planning process is a prerequisite for consideration of Federal Economic Development Administration (EDA) funding and can be used as a city-wide blueprint for future economic development and job creation opportunities. A significant responsibility of the CEDS team, made up of city, community and business representatives, will be to articulate the economic challenges and potential of Baltimore City, and to prioritize city-wide economic development projects and strategies.